Yes, Christmas day finds me sewing and soaking vintage linen in borax in the bathtub to remove weird stains... my dad, mommy-in-law, and hubby all have to work today, so both family Christmas get togethers are later this week and today I am home alone with baby-to-be (almost 15 weeks along!!!) and the critters. 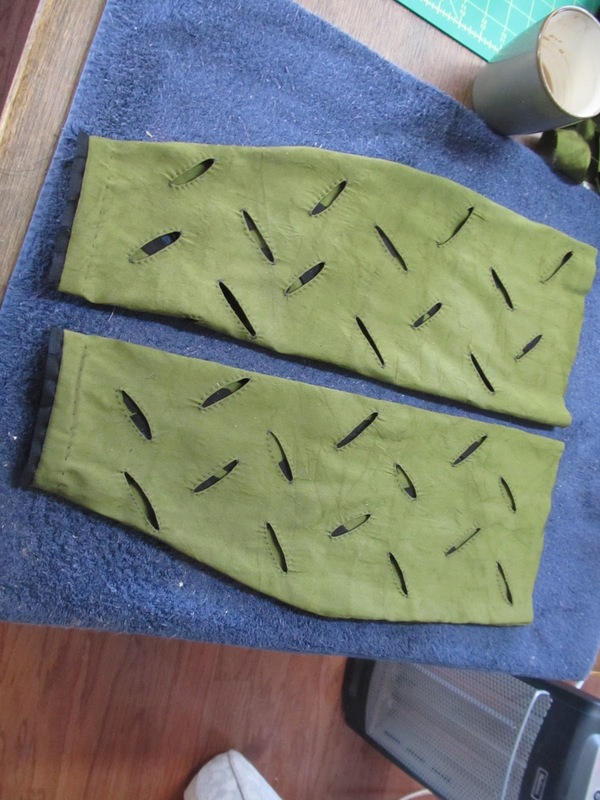 I've been slowly slaving away at the lower sleeves for the Bartolomeo gown between a sudden onslaught of terrible headaches (and, I'm pretty sure, my first migraine ever). I don't think I did them very period accurately, and they are definitely not up to my usual standard of work, but I don't think they turned out too badly. 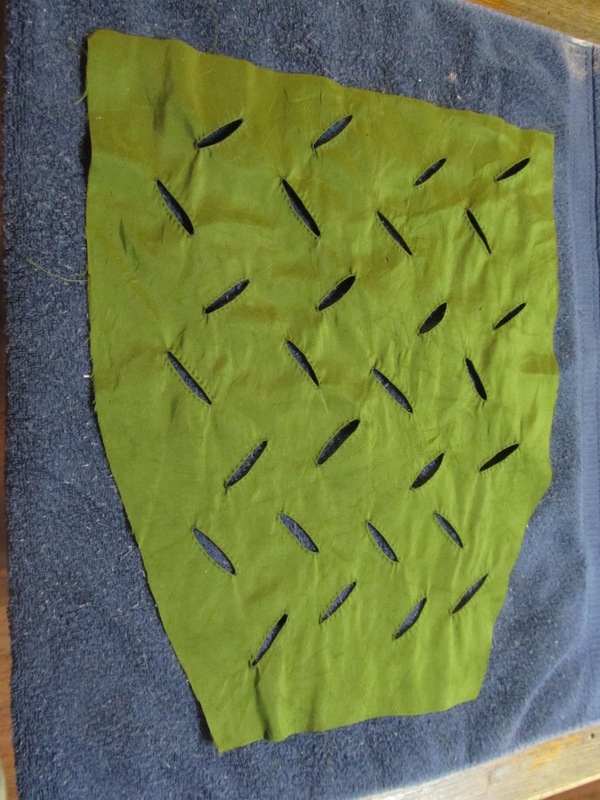 Because I normally cannot stand raw edges being at all visible, all the slashes are faced with an oval of black linen, and topstitched flat by hand, with a bit of whipstitching at the corners for security. I was then going to line it...somehow...but gave up on that hair-brained idea rather quickly. This leaves all the ovals unfinished....but hopefully I will get over that, they are on the inside and for the most part they seem inclined to stay flat and not 'curl' back through the slits. I then sewed the seams by hand with a very narrow french seam and finished off the bottom with more of the black piping and a strip of bias on the inside to cover up the edges. In the portrait it looks like, if anything, the cuffs were finished with tabs of the same olive silk. I thought using the black would tie the sleeves into the gown better, and I already had extra strips cut leftover from the skirt. Next and last is the baragoni! That is this afternoon's project. And then on to accessories. The vintage linen I mentioned above is what I have found for the partlet. It's a light yellow, with a bit of 'tea-dyed' colour to it. I am happy I found it though (Ebay) because the only other linens I could find online were BRIGHT yellow, and I cannot do bright yellow. It is my least favorite colour (except in rare fanatical short lived moments of extreme infatuation), but it does help 'make' the portrait, so yeller 'tis. The grapes I will embroider in dark purple floss, either silk or cotton, depending what I have more of in my stash right now. I also have some lavenderish-blueish silk dupioni to make the sash. And if I am really motivated, I still have leather set aside for gloves (which always seems to be my some-day project). And Hastings has offered to help with the balzo, which has me incredibly excited! I also hope to scrounge up some cool black beads for the necklace and make a new camicia, a scandalously sheer and flowy one:-) Since the neckline of the camicia is not visible in the portrait I have creative leeway there, but whatever I make needs to 'puff' through the small sleeve slits fairly easily, so no stiff linen for this camicia. I'm trying to decide between chiffon or cotton voile.